While Cinco de Mayo is celebrated with great enthusiasm around the country, not many know the significance of the day. Cinco de Mayo is a celebration of Mexican pride and heritage, and is therefore wrongly assumed to be the Mexican Independence Day. 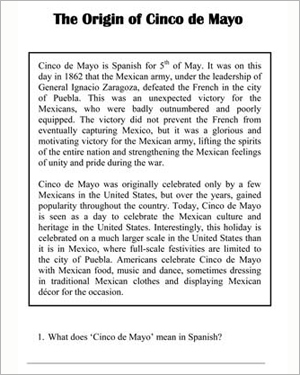 This Cinco de Mayo reading comprehension worksheet tells the story of the Battle of Puebla, and reveals the origin of the celebration of Cinco de Mayo.